Claudia Solomon of Woodlands Rugby eludes a tackler. 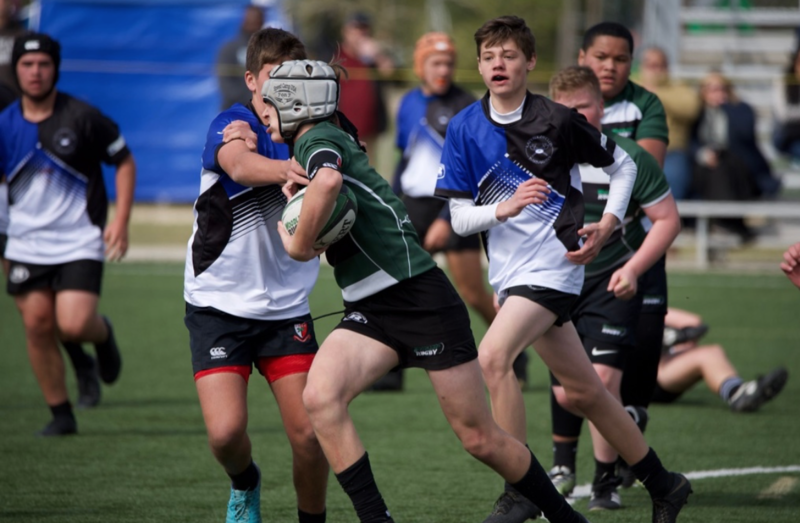 The Woodlands Youth Rugby Club held its second annual ‘Come and Take It’ Rugby Tournament in The Woodlands, TX over Spring Break. Woodlands Rugby along with Rugby Texas and Tournament title sponsor Waste Connections hosted over 600 players representing 38 teams from across Texas on March 16 at The Woodlands Township Gosling Sports Fields. Both boys and girls ranging in age from 5 to 18 came together for what is again being recognized as the largest youth Rugby tournament to ever be held in the State of Texas according to officials with Rugby Texas, the youth rugby organizer for the State of Texas. “Woodlands Rugby symbolizes excellence on and off the pitch. We have a very dedicated Board and are fortunate to have a family of volunteers committed to our Club. However, we would not be able to host such a wonderful event if it wasn’t for The Woodlands Township Parks and Recreation allowing us to utilize their amazing facilities. Our goal is to grow the great sport of rugby, and with the combination of facilities by The Woodlands Township, the administration by Rugby Texas and all the continued camaraderie by the Clubs/Schools in the State of Texas, we are experiencing exponential growth in rugby across the state. This is evident at our ‘Come & Take It’ Tournament,” said Charlie Hopkins, President of Woodlands Youth Rugby Club. 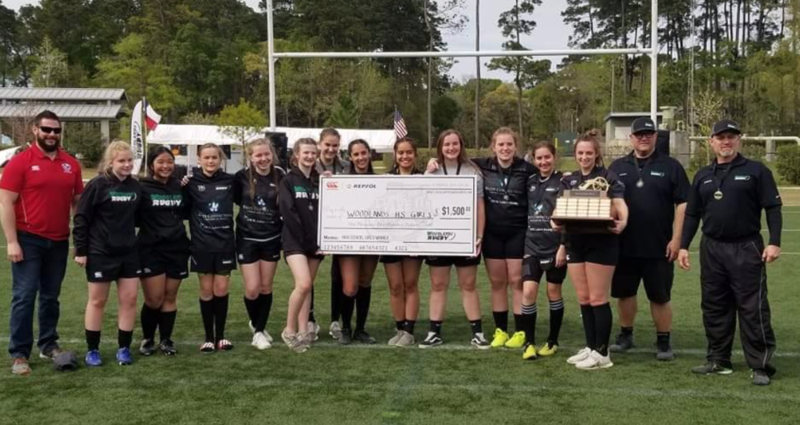 Woodlands Rugby Girls Varsity claimed the High School Girls Championship defeating the HEB Hurricanes in a tightly contested match while the North Texas Barbarians won the High School Boys Championship over Lamar High School. In a first for a Youth Rugby tournament in Texas, Canterbury North America and Repsol E&P USA, Inc. presented both winning teams with $1,500.00 checks to be used for Rugby apparel and equipment purchases with Canterbury. In the younger age brackets, winning teams were West Houston Lions Grades 1/2, Katy Barbarians Grades 3/4, Woodlands Rugby Grades 5/6, Woodlands Rugby Boys Grades 7/8, and North Texas Barbarians Girls Grades 7/8. Proceeds from the Tournament merchandise sales went to benefit HOPE: The Will Herndon Research Fund established in 2009 by Missy and Wayne Herndon, in honor of their son Will, who was diagnosed with juvenile (CLN3) Batten Disease at the age of 6. The goal of the Fund is to bring awareness to juvenile Batten Disease and more importantly, raise money to support research for a treatment and cure. In addition to Ken Davis of Waste Connections, Tomas Zapata Sanchez of Repsol and Pat O’Leary of Canterbury, Woodlands Rugby would also like to recognize the following Tournament sponsors for their generous support of youth Rugby: Joe Castro with JoePlumber, Bret Strong with The Strong Firm P.C., Wayne Stewart with Speed Camp USA, Kerry Johnson with NRG Marketing Group Inc., Jon Wheeler with Wheeler Pediatric Dentistry, Javier Perez with EZ Carwash and Justin Regester with Signsational Signs. Woodlands Youth Rugby Club is a multi-school club sport and competes in the Texas Youth Rugby Association playing both TYRA (Multi-School Clubs) and Texas High School Rugby Conference THSRC (Single School Teams). Over 250 athletes ranging from Kindergarten to 12th Grade, representing Woodlands, Conroe, Montgomery, Klein, Tomball and Spring areas participate in the Woodlands Youth Rugby Club. The Club, founded in 2008, is a non-profit organization committed to providing community-based, recreational and competitive rugby programs for boys and girls.